Wearing: Quiz coral "Bardot" skater dress, Kohl's leopard print slip-ons, Banggood clutch, ZeroUV sunglasses. While this dress is in a more classic style and like the name, Bardot-inspired, the bright coral (in person it's very vibrant, almost like a neon, but didn't pick up well on camera) really made me look at it as a more modern dress, so I styled it as such. I wanted to go for a simple, girly, playful sort-of casual look, so I went with my leopard slip-on sneakers from Kohl's, which I cannot seem to take off....maybe it's because I'm so late on this trend, and I have so many ideas for them built up inside my head! 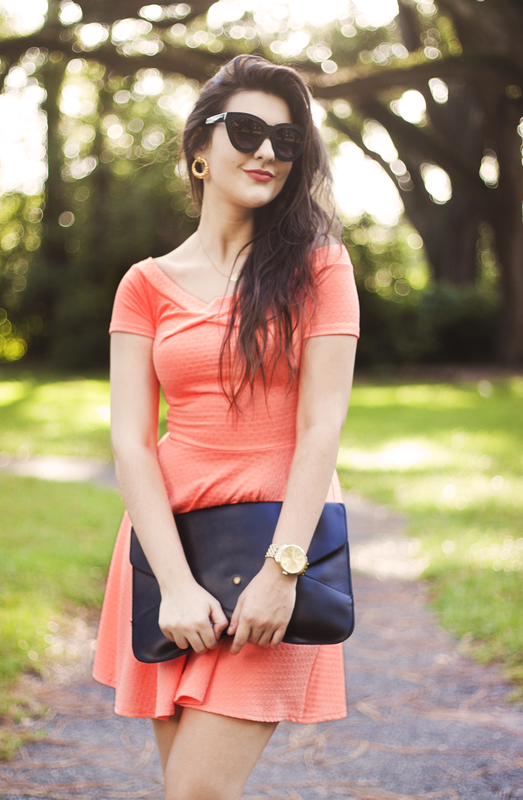 For the accessories, I kept it simple with my favorite envelope clutch from Banggood and black sunnies from ZeroUV. I do really love this dress and outfit, but for some reason don't find the way I styled it to be very flattering on me. Maybe it's just the photos, but this is why I usually try to say with wearing heels, my legs are just so short that I feel they look stubby without some sort of heel helping to lengthen them! But I did get another one of these same dresses except in a super summery white and blue floral pattern...and maybe it's too late for that too since fall is approaching, but it's Florida, so I still got some time left, and I'm going to style it super cute as a way of leaving Summer 2014 with a bang! Also - If you haven't entered my Kohl's $100 gift card giveaway yet, you can enter it now by clicking HERE! When I originally published the post at 4 am the other day I totally forgot to add it in there, but it's up now! Please go enter now, the last day to enter is 9/16! I love how casually cute this outfit is. The color of this skater dress is fantastic paired with leopard print! Looking at this post reminds me that I really need a new pair of leopard print shoes. Beautiful colour of the dress! Amazing photos! A Pocket of Whimsy Collective Giveaway!